Your Ear? Sure, I’ll Take It! Cristina walked into my office and told me she kicked the smoking habit, stopped drinking coffee and, since she wasn’t much of a drinker, stopped drinking as well. “I need help detoxing” she explained. 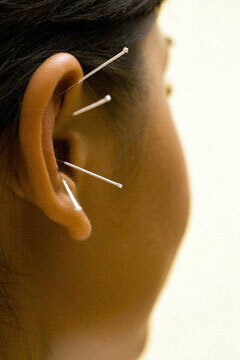 The challenge, however, is that she is afraid of needles and has never had acupuncture before. “So, what can you do for me?” she asked. I showed Cristina the needles - sterile, hair thin, and disposable. As I explained, I watched her flinch at the very idea. So I asked her, “If you have one part of the body that you would give to me which body part would that be?” She said she would give me her ear and that she only has 30 minutes to spare. Auricular Acupuncture is a form of alternative medicine based on the idea that the ear is a microcosm of the body, so there are points in the ears that reflect all of the body's functions and organs. It is a very powerful and exact method to analyze and treat just about any health problem. Auricular Acupuncture is best known as an effective tool to suppress appetite (weight loss) and to relieve withdrawal symptoms from alcohol, drugs and nicotine addiction. However, auricular acupuncture is also an extremely powerful method for pain relief and can also be used to treat various musculo-skeletal problems, allergies, headaches, irritability, stress and many other conditions. Small, fine needles are inserted in specific locations on the ears. Each treatment lasts approximately 20 to 30 minutes. Manual pressure is also used or a small pellet or seed can be placed at specific points on the ear. The pellets are left on the ears for you to press and stimulate the acupuncture points between treatments. Auricular acupuncture has been used all around the world at battlefields for injured soldiers, in disaster areas for post traumatic stress, and for substance abuse. The benefits are amazing, it can help to: promote detoxification, especially when you’ve kicked an addiction, reduce cravings, reduce withdrawal symptoms, reduce stress, anxiety and irritability, and promote a sense of well-being and relaxation. So, if all you’re willing to give is an ear and 30 minutes….I’ll take it!